If you are looking for a simple and economical way to get into digital astrophotography with your telescope, this is perhaps the easiest way to get started. Functionally, this adapter is identical to Orion's SteadyCam adapter and other similar adapters sold under various brand names. 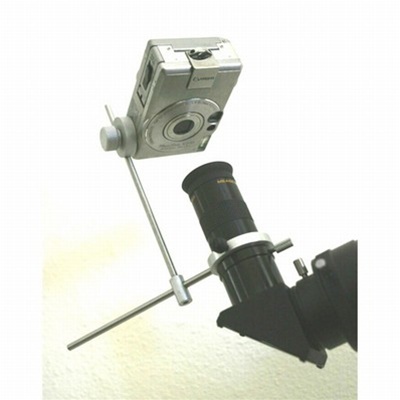 The universal Afocal (through the eyepiece) adapter allows you to securely mount your non-SLR digital camera or camcorder and take pictures of the Moon, bright planets, bright deep sky objects or terrestrial subjects through the telescope eyepiece fitted to the telescope. This bracket does not use your cameras filter ring to support the camera as the other adapters above do. Instead, the camera's tripod socket carries the cameras weight to the eyepiece end. To minimize vignetting of the photographed images, you will usually need an eyepiece with a focal length ranging from 20mm to 40mm. Please note that this adapter is not suited for digital SLR (DSLR) cameras. The "Digital Camera" model will work for most digital cameras and small video cameras. The "Video Camera" model is the same but has thicker shafts to reduce flexing and is recommended for heavier digital or video cameras. All parts (except the nylon screw and the metal set screw) are precision machined from aluminum. With complete control along all three axes of motion, you can position your camera percisely over the eyepiece. (1) Slide the 1.25" ring on the "distance arm" (A in photo) around your desired 1.25" eyepiece and tighten it using the non-marring nylon screw on the eyepiece ring. (2) Then, slide the "height" arm (B) on to the "distance arm". (3) Next, attach your film, digital or video camera to the "camera plate" (C) be screwing the bolt on the plate in to the tripod socket on the base of your camera. (4) You can now slide the camera plate + camera in to the "distance arm" and lock it in place at the desired height above the eyepiece. (5) Finally, use the allen key (D) to loosen and tighten the set (grub) screws on the distance and/or height arms to position the camera at the desired orientation so that the camera lens sits directly above the eyepiece at the desired distance. An extra set screw (E) is also included. No additional instructions are included with the adapter (besides the description above). Using this adapter is a bit tricky the first couple of times, but after that, positioning the camera at the correct angle and distance will become second nature. Review by Mike of Sedalia, MO. Bought to mount a Canon A710IS to my Celestron Nexstar 114GT. Haven't been able to use it for astrophotography yet but it works great for terrestrial photos. It would seem to have a nearly infinite number of adjustments. It even came with some spare hardware (setscrew and nuts) and a plastic storage box. Customer service was outstanding too. Be careful if you try to look through the telescope eyepiece with this attached.